Everyone who has played any form of cricket has had this dream. Playing for your country. Hitting a six off the very last ball to win the match. Heck, we have even made a movie of it. Bhuvan hitting the last ball over the boundary to save 3 years’ worth of tax for his village in the climactic scene of Lagaan. Cricket could never have had greater context, an increasingly elusive commodity in modern times. But I digress. 18th March, 2018. India vs Bangladesh. Dinesh Karthik lofts the last ball over covers to win tournament for India. Bringing a sensational end for what had been a pretty insipid tournament. It was one of the moments to cherish. And a reminder to myself why I love this game so much. Don’t remember when I was last jumping up and down during or after a game. And I had only watched the last 3 overs of this game. In an age of cricketing overdose and no “context” to keep the fans engaged, there came a T20 tri-series (! ), in Sri Lanka (!! ), with Bangladesh (!!! ), where India rested their stars (!!!!) and still sailed through comfortably. At the start, the most interesting bit of the tournament was finding the channel telecasting the tournament– Discovery Sport & Rishtey Cineplex!!! But things got a bit spicy as the tournament progressed, mainly due to the antics of the Bangladeshi players during and after their last game with Sri Lanka. 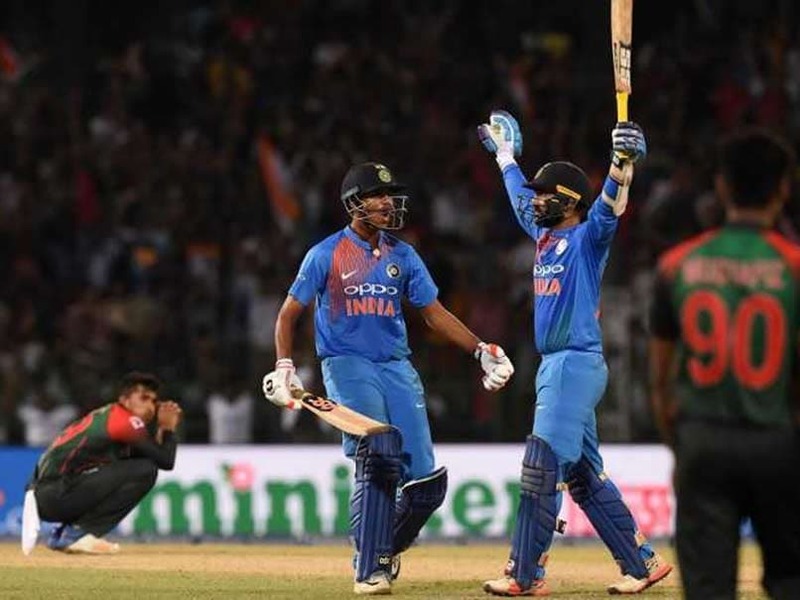 Their “naagin dance” celebrations managed to piss off the Sri Lankan fans to such an extent that they came out in vociferous support of India (!) in the Final. Indian teams over the years have had vocal support in all parts of the world, mainly from our expat population. (Benefits of having over 1.3 Billion of us!!!). But never ever have we had the local crowds supporting us in such a manner! This could be the defining innings for Karthik in an era of abundant wicket-keeping talent. Having made his debut in 2004, has been in and around the Indian team for all this time. Many a times playing as a pure batsman and only on occasion getting to keep wickets in Dhoni’s absence. No one has ever doubted Karthik’s keeping talents. Good to see this unsung performer finally getting his share of the limelight. Never has India’s wicket-keeping coffers been so rich. Dhoni is still there, and then there is a bunch of veterans fighting for his retired Test spot – Saha, Karthik, Parthiv, Naman Ojha, and the IPL brat pack – Pant, Samson, Kishan – vying for the limited overs spot! And just to get the mix more interesting, we have batsmen, who are also employed as keepers – Uthappa, Rahul, Jadhav! What riches in the wicket-keeping talent pool! After such a game, comes out the heartening back-story of Abhishek Nayar, who played 3 ODIs for India, helped Karthik rediscover his mojo. Nayar was also the one who brought Rohit Sharma’s career back on track in 2011. Time to take Abhishek Nayar’s mentorship role more seriously. And finally a few thoughts for Vijay Shankar. Felt sorry for him, as he tried to put bat on ball, but was simply unable to. Seeing his struggles while Karthik blasted from the other end, was a reminder that cricket is a very much individual game masquerading as a team-sport. Vijay Shankar struggled, but in the end, India won, so it was all OK. Hopefully, he does get another chance to showcase his talent at the biggest stage. After all these years, Dinesh Karthik has finally arrived. If nothing else this shot will certainly go down in Indian cricketing folk-lore like Kanitkar's boundary!